Think of calibrating your circuit as setting the thermostat in your home. 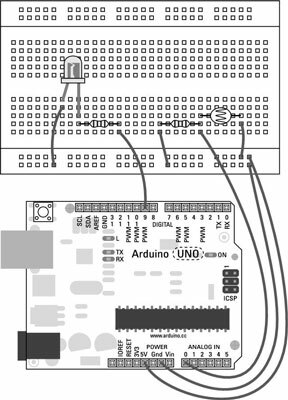 By calibrating the sensors on your Arduino project, you can tailor the sensor to its location. In this example, you learn how to calibrate a light sensor. Light, of course, is highly variable, whether you’re inside, outside, in a well-lit room, or working by candlelight. Despite the huge variation, all these ranges of light can be sensed and interpreted by your Arduino as long as it knows the range that you’re working to. The following sketch shows you how to calibrate a light sensor to its surroundings. 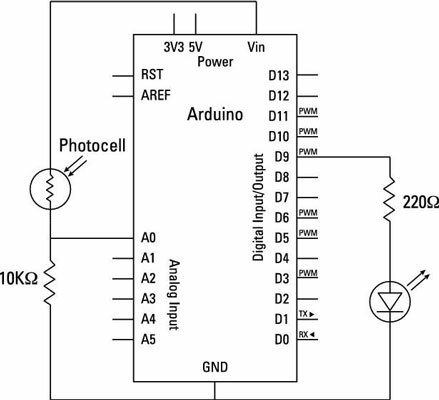 Complete the circuit to calibrate your light sensor automatically. attached to the sensor pin. The sensor minimum and maximum initial values may seem backwards. maximum low and listen for anything higher as the new maximum. Upload the sketch, and let your Arduino settle with your normal ambient light levels for five seconds. Then try moving your hand over it. You should find it a lot more responsive than it is when it’s just reading the analog value normally, and the LED should have a range from fully on when it is open to fully off when it is covered.